SEGA roar into view on Wii U with Sonic and All-Stars Racing Transformed, delivering a karting experience that proves a most commendable substitute to Nintendo’s own pedigree series in the genre. Yet this is a game that takes great strides in new directions. Sumo Digital is once again behind the wheel, crafting a thrilling concoction that sees success awarded to those that master the game’s key drifting and boosting mechanics. Most impressive is the transformative capability of your vehicle which shifts between car, boat and plane dependent on the course terrain – the detail of which is something that must have taken considerable effort from the developer. Courses themselves are vibrant, taking their inspiration from gems plucked from across the history of SEGA’s back catalogue. Golden Axe, Skies of Arcadia, Shinobi, Panzer Dragoon, NiGHTS into Dreams, Samba de Amigo and Jet Set Radio are all in here, to name but a few. You’ll initially want to spend the majority of your time in Career mode, and, more specifically, gunning your way through World Tour. This sees you challenged with completing multiple series of events that, upon successful completion, reward you with stars. The quantity you receive is determined by the difficulty level you choose to play on, with Easy granting you a single star whereas Expert showers you with four. These are important not only for your continual progression through each of the chapters, which range from Sunshine Coast right through to Superstar Showdown but also serve to allow you to unlock further characters to race as. Whilst the majority of what I’d describe as being the ‘core’ SEGA characters are available to you straight away, those wishing to play as the likes of Amigo, Vyse, NiGHTS, Joe Musashi, or IndyCar legend Danica Patrick, will have to push their skills to the limit. 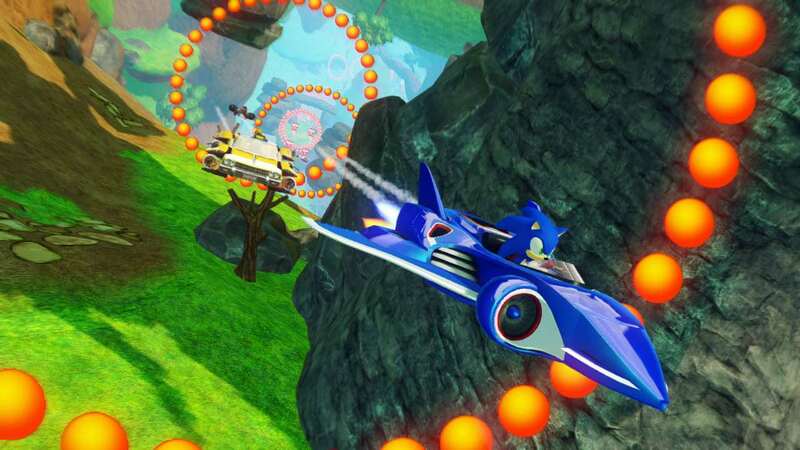 Sonic and All-Stars Racing Transformed‘s event variety impresses throughout, which sees you compete in differentiated challenges. A straightforward Race proves to be standard, with Traffic Attack seeing you dodge cars lining the track, and Ring Race seeing you pass through a set course within the time limit. Whereas Pursuit sees you trying to eliminate an aggressive tank, and Drift Challenge tasks you with drifting in designated zones to increase time left on the clock as you speed towards the finish line. Grand Prix tournaments, Time Attack challenges and Single Races also beckon you when playing alone, extending the range of content on offer. Beyond this, Match Making and Custom Game amount to the game’s multiplayer offering. The former allowing you to race against other players online, across Race, Arena and Lucky Dip modes. Leaderboards allow you to keep a track of how both yourself and your friends are progressing, with each player awarded an overall rating dependent on their successes and failures. Whereas Custom Game governs the ability to jump into split-screen multiplayer, play private games online, and Party Play with up to five players. This sees one player using the Wii U GamePad’s screen, whilst the other four players can grab any available controllers, including the Wii U Pro Controller, Classic Controller Pro and Wii Remote (with or without Nunchuk). An area in which the game does let itself down is the weapon pickups. Gathered through question mark bubbles these feel largely uninspired, with variants on the usual array that populate the genre. Blowfish mines, Boosts and Firework rockets muddled in with more creative examples such as the Drone. All-Star moves also return, enabling you to catch up with your rivals if you fall behind. Drones themselves also provide an example of how the Wii U GamePad has been supported, with a camera tracking their pursuit of whichever target they’re aiming for on the screen. Further functionality allows you to utilise a rear view mirror by lifting the GamePad, whilst tapping on a competing racer will grant you the option of following their progress. Whilst such implementation by Sumo Digital is commendable, it becomes hard to shift your focus between the main screen and such enhancements on the GamePad. They’ve also added in support to play the game solely on the GamePad itself, which works well for the most part aside from a visual downgrade. All in all, Sonic and All-Stars Racing Transformed amounts to a fast, furious and tantalising game that will surely find appeal with gamers. One of the strongest offerings amid the Wii U’s early software line-up, be sure to pick it up.